ALL is divine. When we are firmly established in the truth of our divinity, we will directly realise that others too are Divine. Compassion for others is felt as long as we do not consider ourselves as separate entities. There is a story to illustrate this truth. A certain lady prepared some sweets for Shirdi Sai Baba. Somehow it so happened that a dog entered the house and ate them. The lady beat the dog with a stick and drove it away. Once again she prepared a plate of sweets and carried them to Baba. Baba refused them saying that He had eaten them and that His hunger had been appeased. The lady said that this was not possible because she had brought the sweets for the first time. Baba said, “No, I ate the sweets you prepared. 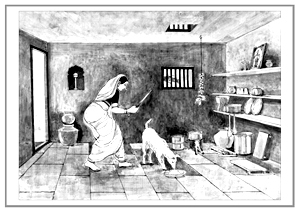 I was beaten with a stick and driven away by you.” The lady wondered for a while what Baba meant and then suddenly remembered how the dog had entered her house and eaten the sweets and was beaten by her. In this way Shirdi Baba made His devotees understand that He was not confined only to His physical form but is the indweller of all living beings.